There’s a story I used to tell my college roommate’s little sisters that would make them squeal with joy every single time: There was once a fire in my house (not the laughter part) and upon seeing the flames, my dad ripped the Nintendo console out of the wall in my brothers’ bedroom, dashed downstairs and got everyone — and the Nintendo — safely out of the house. That’s how we explained having the console later but not the necessary cords to connect it. Ridiculous! Who saves a Nintendo in a fire? Hilarious. Well, kids, my father has since refuted the story and claims that he did not, indeed, save the video game system over the fish (Larry, Curly and Moe). Which still doesn’t explain how it ended up safe and unmelted, but okay, Dad. But one Kansas man did do just that, a report from ABC15.com reports. He awoke early one morning to find his home in flames and at first, did just what you should — he ran out of the house. He then reportedly ran back into the flames to gather his Xbox into his arms and ferry it to safety. As a result of his rescue actions, fire officials say he suffered smoke inhalation but was generally okay after being checked over by paramedics. The fire was likely caused by an electrical junction box, and ended up causing $80,000 in damages. But it could’ve been $80,000 + one Xbox, so, there you go. 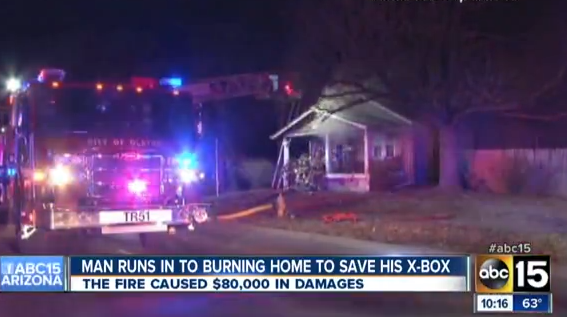 Just a reminder — don’t run back into the house to save a video game console. Just don’t.